One of the best parts of finding a great family dentist is that everyone — mom, dad, and children alike — can be seen in the same location. Not only is this convenient for our patients, it also helps us to get to know your family better and look after your child’s smile as he or she grows up. What Happens During These Early Visits? As parents, it’s normal for us to wonder why baby teeth need to be treated or restored, if they’re only going to fall out a few years later. In short, it’s because decay can spread rapidly through baby teeth, causing unnecessary toothaches, abscesses, hospitalizations, and tooth loss. When a baby tooth is lost prematurely, it can permanently impact the way adult teeth erupt into the mouth. A child’s smile has a huge impact on the development of their adult teeth. Early cavities, habits (such as thumb sucking) or athletic injuries during later years can play huge roles in the overall health and development of their teeth. By bringing your child to a family dentist early, you’re instilling a positive perception of dental care. Waiting until they’re in pain will only make going to the dentist feel like something that’s linked with negative memories or even scary. A positive experience affects your child’s entire perception of how they will envision trips to the dentist once they get older. Exam and Cleaning — Your child’s routine dental check-up will include a cleaning and exam. During these appointments, we will also discuss smart diet choices and review proper oral hygiene habits. Digital X-rays — By seeing through and between areas not visible during a visual exam, we can pinpoint cavities in their earliest developmental stages. X-rays are also vital to assessing orofacial development, screening for missing teeth, diagnosing cysts, etc. 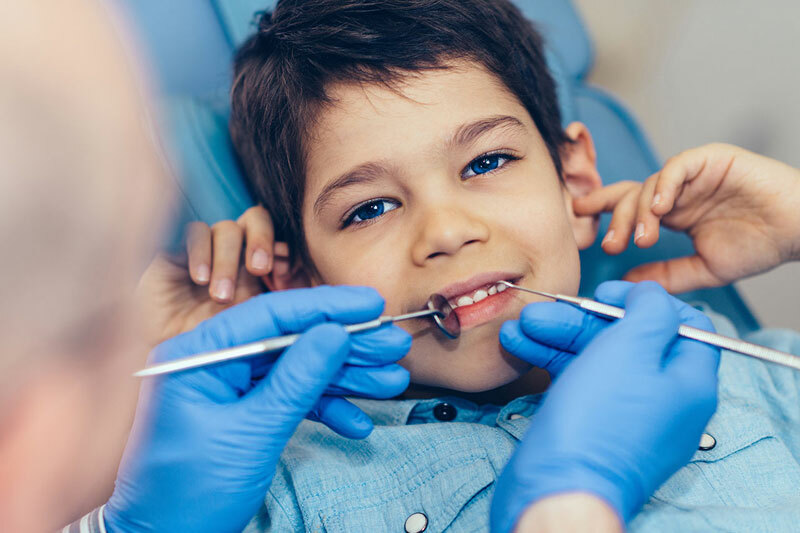 Protective Sealants — Smooth, clear coatings in the deep grooves and pits of adult molars (back teeth) make teeth easier to clean and block out cavity-causing germs. No numbing is necessary! Fillings — Modest white fillings are minimally invasive and prevent decay from expanding deeper into the tooth. Early treatment is vital, as decay can also “jump” or spread to adjacent teeth. Crowns and Pulp Treatments — Placing a crown over damaged baby teeth helps to extend the length of time that they stay in place. Pulp capping or pulpotomies are a pediatric version of root canal treatment, which is sometimes necessary. Extractions and Space Maintainers — Non-restorable or severely decaying teeth are often removed to eliminate pain and the spread of infection. If the tooth is still serving as a place-holder for a developing adult tooth, a space maintenance device may also be necessary. Orthodontic Evaluations — A child’s bite is ever evolving. By age 7, we can start to determine if any type of interceptive orthodontics or growth modification will be necessary. If they are, we can refer you to an orthodontic specialist at that time. We also offer in-office Invisalign treatment (the clear braces solution). Pediatricians and pediatric dentists agree: children should have their first dental visit by their first birthday or when the first tooth erupts. Schedule your family’s next dental visit to our family practice today!